Since the December 7, 1941, attack on Pearl Harbor, countless historians, military experts, and World War II aficionados have debated the strategic decisions regarding the placement of the United States Naval Fleet in the Pacific. Now, for the first time, author Skipper Steely presents a detailed biography of the man who fought to prevent the massacre—Adm. James Otto Richardson. 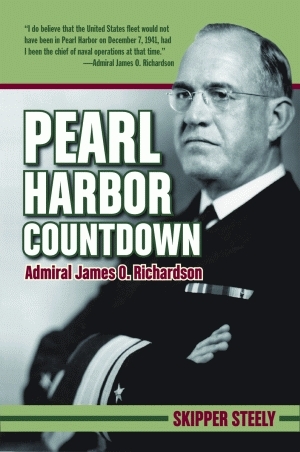 Through his comprehensive treatment of the life and times of Admiral Richardson, Steely explores four decades of American foreign policy, traditional military practice, U.S. intelligence, and the administrative side of the military, exposing the largely untold story of the events leading up to the bombing of Pearl Harbor. Born into a family of educators and Civil War veterans, Otto Richardson was schooled from an early age in strategy, tactics, and policy. A graduate of the U.S. Naval Academy at Annapolis, Richardson spent his formative years as a naval officer in Asian waters, experiences that would prepare him for the ultimate challenge of serving as the commander in chief of the U.S. fleet at Pearl Harbor in 1940. When Pres. Franklin D. Roosevelt issued the order that the U.S. fleet remain at Pearl Harbor indefinitely in 1940, without first consulting with the highest-ranking naval officers on the matter (Richardson included), Admiral Richardson reacted. Drawing from over thirty years of experience, Richardson recognized how vulnerable the fleet was in such an exposed and remote position, a logistical nightmare only made worse by the fleet’s slim resources and lack of preparation and organization. Despite his adamant urgings to his civilian superiors, Richardson and his fleet remained in Hawaii. Richardson’s warnings and protests prompted President Roosevelt to strip him of his command, opening the United States to the Japanese attack on December 7, 1941. Skipper Steely graduated from East Texas State University in 1968 and has worked as a newspaper writer and an editor for most of his life. In the early 1970s, he worked as a public relations and recruiting officer with the United States Air Force, advancing from second to first lieutenant before he was honorably discharged from the service. Steely has been writing full time since 1990, primarily focusing on history, but also enjoying writing sports and adventure novels. He lives in Paris, Texas.